The CMEC Copyright Consortium developed this statement to underscore its support for the educational use of the fair dealing provision of the current Copyright Act and for the copyright policies and procedures in use by elementary and secondary schools in response to the 2012 Supreme Court of Canada decision on copyright and the educational use of fair dealing. The CMEC Copyright Consortium is composed of all provinces and territories, with the exception of Quebec. This report is in response to the request from UNESCO that its Member States complete two questionnaires on the UN Decade of Education for Sustainable Development 2005–2014 (UNDESD). 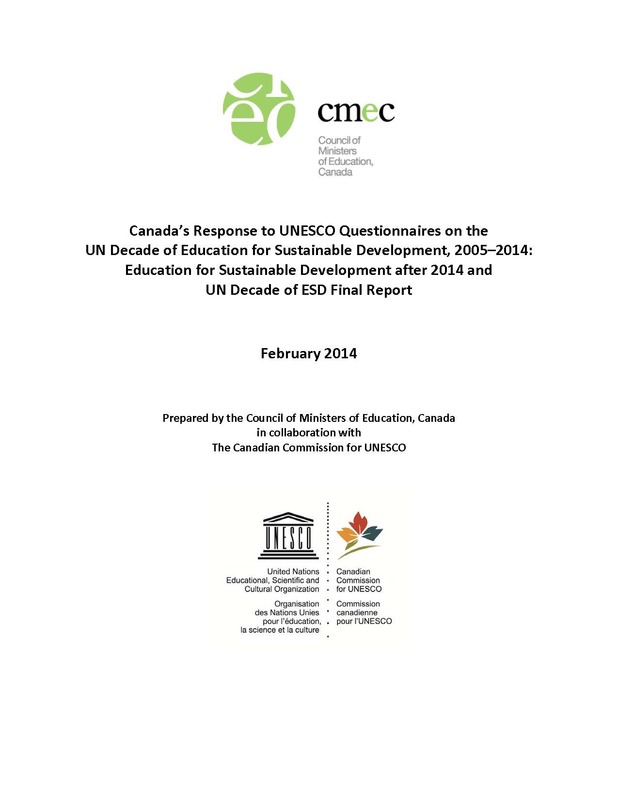 Questionnaire 1 focuses on collecting information on Canada's priorities for ESD after the end of UNDESD. Questionnaire 2 focuses on compiling Canada's achievements and challenges over the decade. Canada's responses were developed jointly by CMEC and the Canadian Commission for UNESCO (CCU). This report summarizes the main issues discussed at the First Consultation of the Americas – Ministers of Education: “A New Culture of Health in the School Context,” held in October 2012 in Mexico City. It also provides the main messages conveyed by the Canadian delegation to participants. The consultation focused on successful practices in four priority areas: obesity, lack of physical activity, substance abuse, and sexual and reproductive health. This report contains the main outcomes of the OAS VII Inter-American Meeting of Ministers of Education held in March 2012, along with interventions by the Canadian delegation. The meeting focused on a variety of issues, including the teaching profession, schools as learning communities, the role of government as guarantor of a quality education, and the work of the Inter-American Committee on Education (CIE). In addition, ministers approved the Declaration of Paramaribo — “Transforming the role of the teacher in response to 21st-century challenges” — and elected the new CIE Authorities for the period 2012–2014.